The last full week of the summer has been a busy one for the running community with races the length and breadth of the country and a few further afield as well. Springwell RC’s purple vests have been out in force resulting in the usual collection of podium places, age category wins and even a ten year old club record being broken. 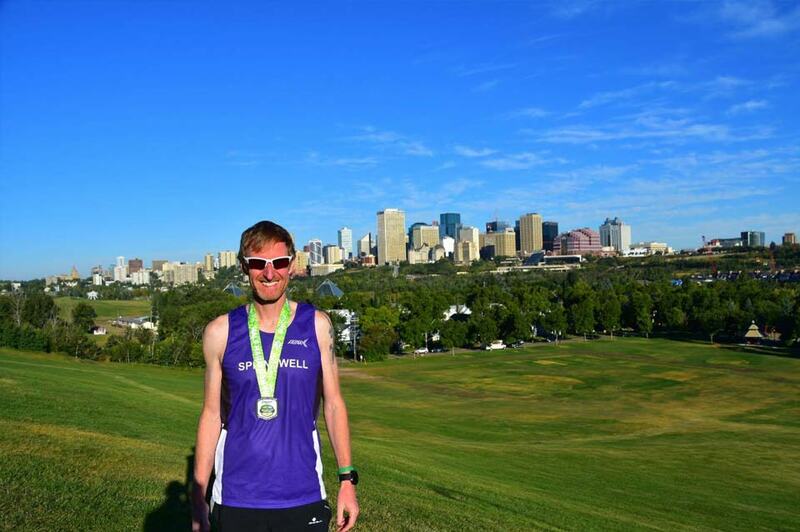 The annual Edmonton Half Marathon was held on 20th August with an international field of athletes taking on the humid conditions in Canada. 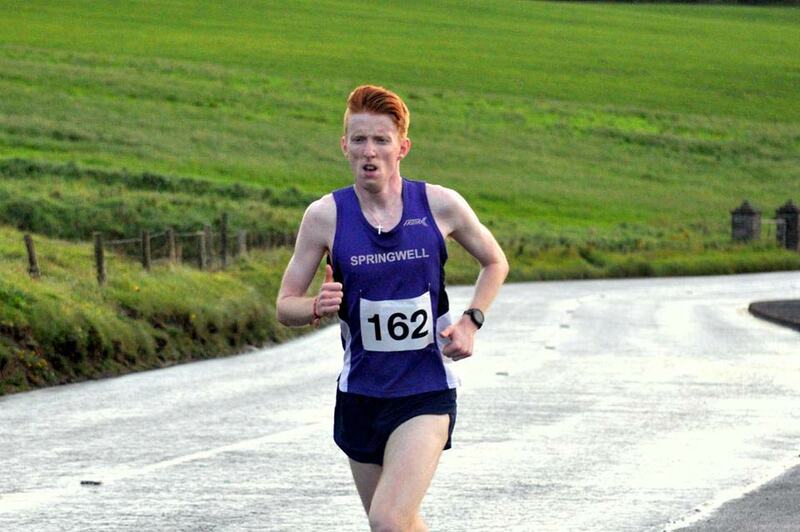 Springwell RC’s Simon Stewart put in a fantastic performance to finish in 11th overall and 10th in the men’s race with a time of 1.14.41, taking 6 seconds off the club record for the Half Marathon which was set at Dervock in 2007. On Wednesday 23rd August, nearly two hundred athletes took on the annual Dessie’s 10k road race hosted by City of Derry AC at Gransha Park in the Maiden City. In the mens race Declan Reed (City of Derry AC) and Scott Rankin (Foyle Valley AC) both returned to competitive racing having missed most of the summer. They both produced excellent performances with Declan winning in 31.27 and Scott taking second place in 31.55. Gavin Corey (Sperrin Harriers) completed the podium finishing third in 33.30. In the ladies race, Ciara Toner (Springwell RC) continued her recent good form winning in 38.09. Jackie McMonagle (City of Derry AC) claimed second place in 40.31, before Karen McLaughlin (Springwell RC) crossed the line in 41.34 for third place. Springwell RC Results - 18th Philip Mullan 37.57 (1st M50), 19th Ciara Toner 38.09 (1st Lady), 20th Andy Dowey 38.34, 28th Eddie Clyde 40.17, 39th Hugh Boyle 41.29 (1st M65), 40th Karen McLaughlin 41.34 (3rd Lady), 41st Gerry O’Doherty 41.44 (1st M60), 52nd Warren McIlmoyle 43.02, 60th John Butcher 43.46 PB, 61st Kerrie McIlmoyle 43.54, 79th Barry McCluskey 45.18, 119th Julie Millican 49.54, 127th Owen Anderson 50.39, 137th Janet Patrick 52.39. The Portrush 5 Mile Road Race in aid of Prostate Cancer and Autism NI took place on Friday 25th with almost 300 athletes turning out to support the event. The rainy weather abated in time for the race start at 7.30pm leaving perfect running conditions for the evening. Starting on the Bushmills Road, adjacent to Royal Portrush Golf Club runners faced an uphill first mile to the Ballybogey Road junction, before continuing along the Dunluce Road to the Magheracross viewing point where they turned to run the three miles back down the Dunluce Road and onto Causeway Street to finish on the East Strand adjacent to the Water Sports Centre. In the men’s race Springwell RC’s Jonathan McKee and Luke Dinsmore contested the lead from the start with Jonathan establishing a lead by the turning point at Magheracross which he held to win in 26.34 with Luke recording 27.04 for second place. Chris McGurk (Glasslough Harriers) finished third with a time of 27.35. The ladies race was dominated by Esther Dickson (Newry AC) who won with a time of 31.18. Faith Viney (unattached) took second in 32.26 and taking her third podium place in ten days Karen McLaughlin (Springwell RC) finished third with a time of 32.42. Springwell RC Results - 1st Jonathan McKee 26.34, 2nd Luke Dinsmore 27.04, 10th James Stewart 30.25 (1st M35), 12th David O’Neill 30.28, 15th Ross Armstrong 31.13, 29th Alister Jamison 32.33, 31st Karen McLaughlin 32.42 (3rd lady), 35th Andrew Surgenor 33.06, 36th Hugh Boyle 33.10 (1st M60), 38th David McGaffin 33.24, 44th Nigel Armstrong 34.01, 56th Alan McIlfatrick 34.55, 62nd Terry Glenn 35.19, 67th Caroline Irwin 35.34, 69th Simon McLean 35.41, 70th Alan McKeeman 35.43, 72nd Meabh Close 35.51 (1st F45), 77th Keith Nixon 35.57, 81st Gary Kendall 36.17, 90th Hugh Deighan 36.51, 104th Noel McAllister 37.45, 107th Geoff Glass 37.50, 114th Gary Greene 38.26, 128th Mark Neely 39.06, 130th Elizabeth Deighan 39.12 (1st F55), 159th Helena Dornan 40.28, 164th Andrew Wilson 40.47, 173th Ally Kelly 41.12, 174th Patricia Craig 41.21, 181st Carolyn Crawford 41.57, 183rd Liz Dowey 42.00, 187th Ian Coulter 42.20, 211th Rowena Baker 44.19, 212th Richard Baker 44.20, 214th Ursula Harper 44.25, 221st Hayley Neely 44.46, 222nd Emma Elder 44.47, 241st Emma Birrell 46.33, 256th Elaine Montgomery 48.52, 257th Catherine Byers 48.52, 258th Kathy Donaghey 48.58, 262nd Michelle Sweeney 49.34, 264th Caoimhe Armstrong 50.01, 266th Amy Dobson 50.23, 286th Caroline Owen 53.22, 295th Kenneth Bacon 55.41. 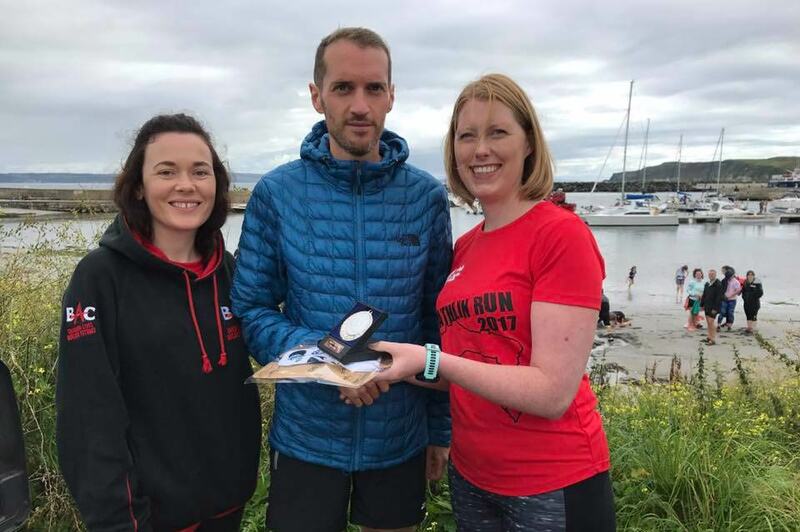 Situated 6 miles off the Coast of Ballycastle, getting to the event on Rathlin Island provided runners with their first challenge but when combined with the stunning scenery of the island it makes for a unique running experience. Hosted by NiRunning with assistance from well-respected charity Belfast Activity Centre (BAC), the event offers participants the choice of a 10 mile or 5k race. So on Saturday 26th August in good running conditions almost 200 runners set off on the 10 mile route from Church Bay, which would see them reach the island’s west light house and RSPB Centre, before making their way back to the atmospheric finish area at Church Bay. Philip Goss (North Belfast Harriers), Steven McAlary (Springwell Running Club) and David Turtle (East Antrim Harriers) contested the lead from the start but as the front runners reached the further most section of the course at the RSPB Centre, Philip and Steven moved clear, with little separating the pair. On the return, North Belfast Harriers man Philip broke clear to take victory in a new course record of 57.57. In form Steven McAlary held onto second with 59.48. David Turtle finished in third with 1.03.08. In the closely contested ladies race, it was Northern Ireland masters cross country international Gerrie Short (Beechmount Harriers) who emerged victorious, taking first place in 1.12.16. Helen Weir (North Belfast Harriers) finished second in 1.13.55 and Sarah Porter (unattached) completed the podium in 1.17.22. In the associated 5k event, athletes started in Church Bay and made their way towards the south side of the island, before turning at a designated point and making their way back towards the finish area along the incredibly scenic coastline. James Robinson (East Coast AC) led the field home for a well deserved victory in 19.31. Catherine Diver (Beechmount Harriers) impressed with a 2nd place finish overall, therefore taking the ladies title in 19.53. Ballymena Runners’ Peter Fleming crossed the line in 20.08 for 2nd place in the men’s race, before Clive Robinson (Riada Tri Club) completed the men’s podium in 20.38. Maria Morris ensured Beechmount Harriers dominated the podium running 22.48 for 2nd place. Orangegrove AC’s Harriet Anderson crossed the line in 26.15 for third place. Springwell RC had two members competing at this prestigious track and field meeting at the Mary Peter's track. In the women’s 1500m Niamh Carr finished second with a time of 4.59.32 and in the mens 3000m Neil Johnston continued this season’s excellent form wining in 8.27.95. Sunday 27th August saw over 3000 runners take to the streets of Aberdeen for the inaugural Simplyhealth Great Aberdeen Half Marathon. Springwell RC’s Becky Coulter was one such runner finishing 786th in 1.49.47. 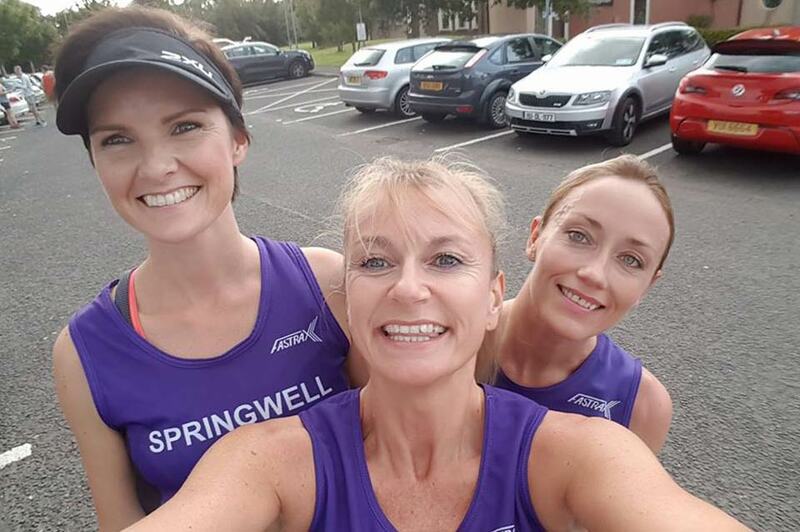 This weekend Springwell RC had 51members doing Parkruns in 8 different venues with two members recording personal bests.